Decks vs. Patios: Which is right for your home? One of the most common questions we hear is “what is a better resale value for my home, a deck or a patio?”. We see a ton of folks that are sick of staining and varnishing a wooden deck, and are looking at other options. Most of the time the paver patio will be comparable to a wood deck in price, but you’ll find that it has some other huge benefits. A paver patio is going to be more flexible than a deck or concrete slab. You can always add onto a paver patio or completely move it if you want. Paver patios will also have no maintenance. Many homeowners we talk with are apprehensive of getting a patio and instead want to settle for a concrete slab. The biggest fears are settling and weeds. If your patio was properly graded, and installed there should be no weeds and no settling over time. It is only when the contractor is cutting corners that you will run into these types of issues with a paver patio. There are so many options for natural paver stones, and unlimited configurations. Talk with your contractor for pricing and selections available. Pinterest is always a great place to start gathering ideas but remember that the finishes you select can start to add up and may not be right for your project. A professional can help you weed out the “nice-to-haves” that won’t work for your home. Paver patios come in at an average of $18/sqft for a simple design with a basic paver. The cost can increase dramatically when selecting natural stone and other custom options. While a composite deck has a higher return on investment for resale value at 70%. A paver patio is not far behind at 50-60%. A paver patio is going to be more flexible than a deck or concrete slab. You can always add onto a paver patio or completely move it if you want. Paver patios will also have no maintenance. You can also incorporate other features like firepits, water features, fireplaces, and outdoor kitchens. With all of these great reasons to put down a paver patio, you might wonder why anyone would ever install anything else. Well, there are some cons to patios. A paver patio needs to be placed on a foundation of gravel and sand that is deep enough to prevent shifting and dipping. If you are looking for a DIY option – patios may not be for you. Professional patio installers have all the right tools and can ensure that the patio will last as long as your home. Choosing who to hire can be more important the what to install. 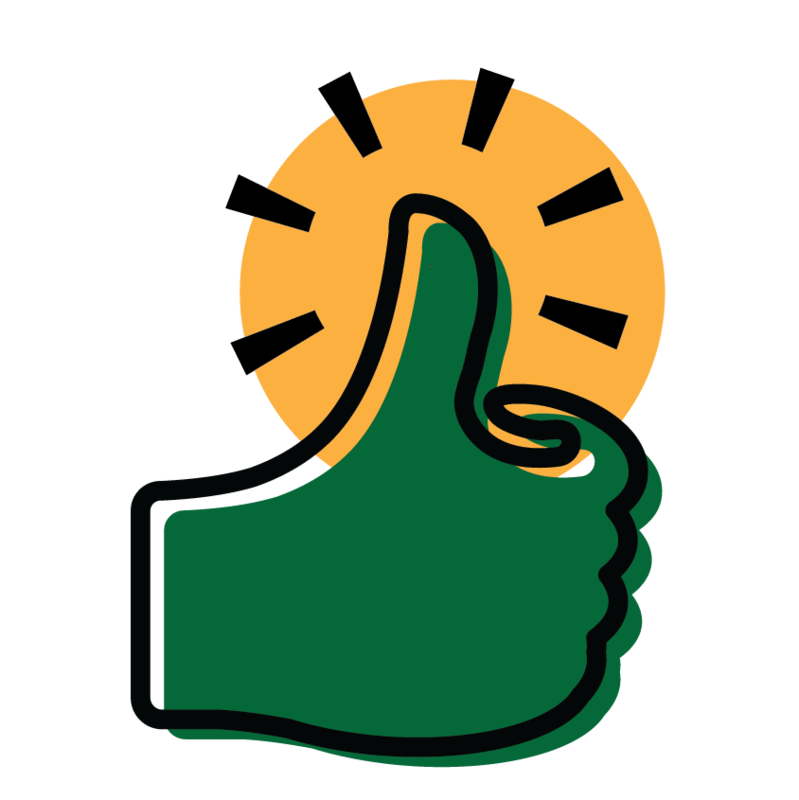 Take a look at 6 Questions to Ask Any Contractor for some great pointers on hiring the right company for the job. A wood deck is a very affordable option… initially. Be prepared to pay for stain, sealer and supplies every other year or so. While wood decks can be a great option for some homeowners, keep in mind that your investment is not protected without quite a bit of maintenance. Coming in at about $15/sqft a wood deck is a deal! The cost of materials is the main factor effecting the price. Wood decking boards are inexpensive and make for a nice usable entertainment space. You are going to be in a stain wonderland when you start picking out finishes for your new wood deck. There are tons of stain options to choose from, you could even paint your deck if you wanted to. Make sure you save the can or write down the color because 3 years down the road you may find yourself purchasing more. The cost of time and supplies you will use over the lifetime of the deck can add up to quite a bit. You could end up doubling the cost of the initial install with the cost of maintenance. Decks can hide problems next to your house and foundation. We see many cases where the ground around a home is sloping toward the homes foundation underneath the deck. The homeowner is none the wiser though because the decking is covering up the grading issues. It is very important to have the areas around your foundation sloping away from your home so that water flows away from your house. No one likes water in their basement. Wood is not inherently weatherproof. Wood deck should be made using green treated boards. This keeps them from rotting, especially where they come into contact with the ground. 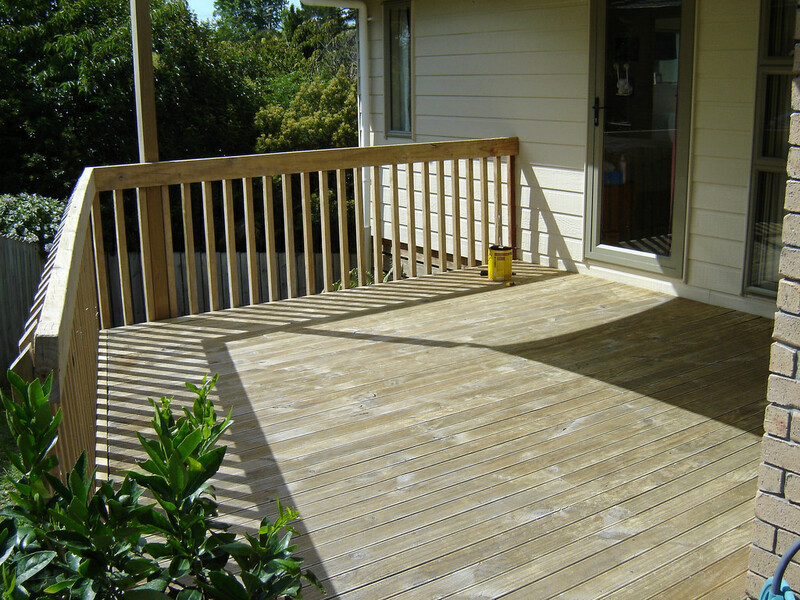 If not maintained properly you could end up with a deck with grey, weathered boards. 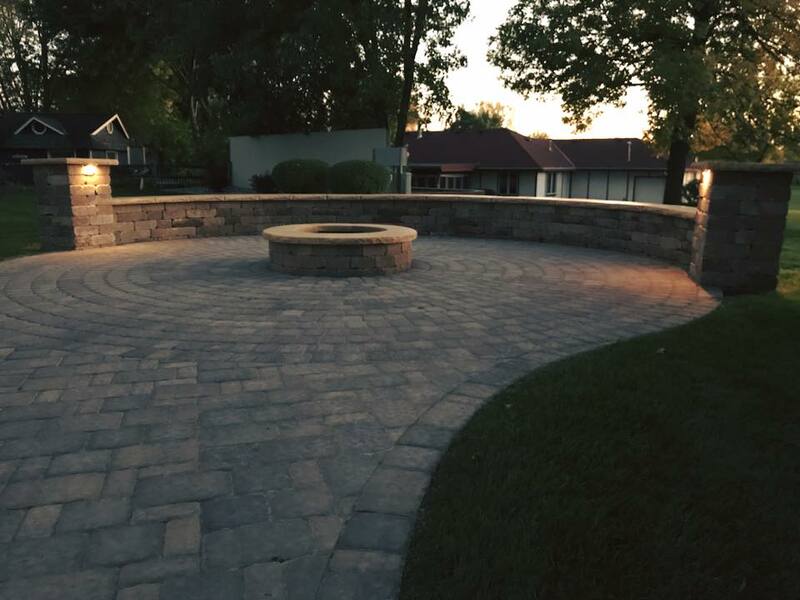 If you’re not sure which material to use for your next landscaping project or if you’re having problems choosing between a deck or paver patio, give us a call with your questions or to schedule a meeting with one of our team members. A composite deck is a great low maintenance option. They look great, but as with all options there are some downfalls to take into consideration. Whether you plan to sell your home or not, looking at the possible returns from home projects is always important. Composite deck has a higher return on investment for resale value at 70% compared to a 50-60% return on paver patios. Composite decking’s biggest draw is the fact that it is essentially no maintenance. Because it is a manufactured pre-finished product there is no need to stain or seal it. Once it is installed you will just need to spray it off with the hose every so often to keep it clean. Composite decks look nice when done right. They don’t fade like wood decks because they don’t use stain and sealer. While composite decking certainly has some big points in its favor, they do have some drawbacks as well. 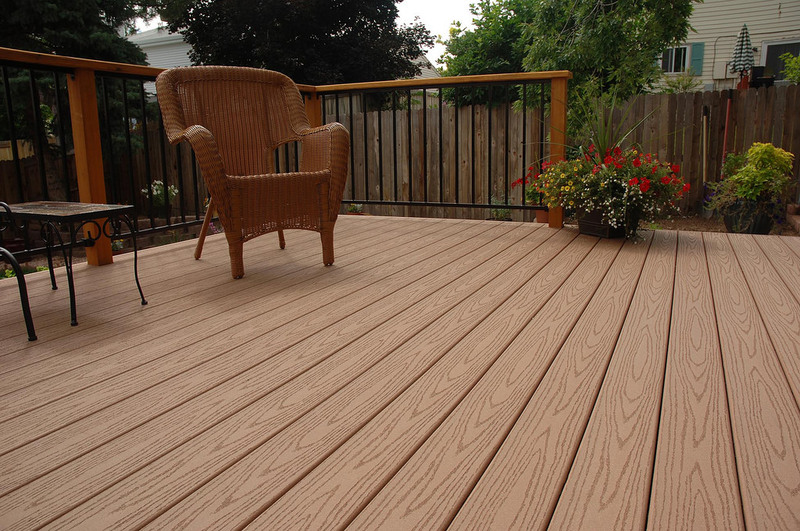 Composite decking is the most expensive option at $33/sqft. Average costs for a composite deck can be $10,000 and up. It isn’t unheard of to spend $25,000 on a larger composite deck. As we mentioned above, decks can hide problems next to your house and foundation. If you are going to spend the money on a composite deck be sure that you or your contractor are creating a great foundation to prevent problems and water issues in the future. We have worked on projects where the homeowner wants a deck and paver patio combined. This has either been with composite steps from the house down to a paver patio and walkway. We have even tied in an existing deck into a new patio. Or if the homeowner is on a tight budget we might work up a cost effective stair option and a more elaborate paver patio. The clear winner in our book is a paver patio. The huge benefit of not only with the cost, but also with no maintenance and future adaptability. We love the new trends coming out with paver stones and the ability for us to create extravagant designs and setups that fit a home and lawn perfectly while leaving the homeowner happy.